The Grand Tour is officially done with Mike Skinner The American, but it needed a new hot shoe for track tests, and the awesome news is that the role’s gone to a woman for season two. 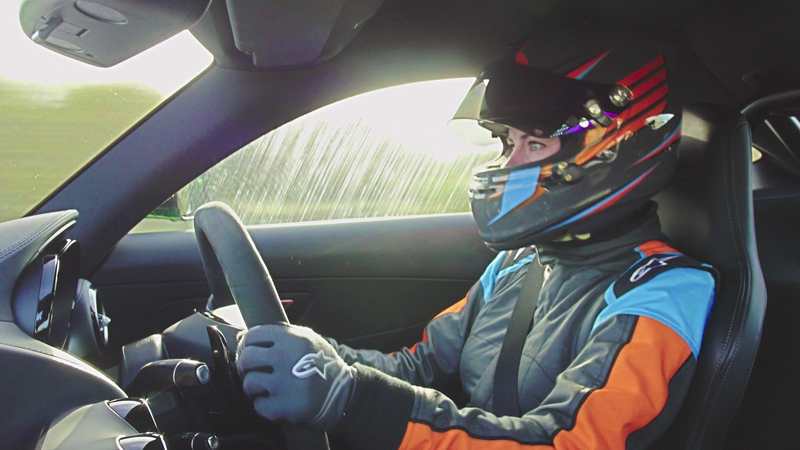 She’s racing driver Abbie Eaton, but you wouldn’t know that from actually watching the show. We’ve known that the show was searching for a new racing driver after they announced that Skinner wouldn’t be on the show anymore. In a November interview with The Daily Telegraph and reported on by MotoringBox, James May revealed that their new driver was a woman, but kept her name a secret. Last night, we got to meet Eaton for the first time, during which she thrashed a viper-green Mercedes-AMG GT R around the test track. It was fantastic. I’m very excited to see her on the show. Clarkson: “And she’s off. Tidy start, no wheel-spin, full power from the twin-turbo V8 to the first corner. Will she lift? No, it didn’t sound like she did. “Right, second corner. Balancing the car nicely. God, that thing looks planted. “Right, here we go, this is the tricky bit. Let’s have a look at how she’s getting on ‘round here. Oh, that thing looks planted! And quick! And she’s on the raggedy edge on the down-changes. Michelins squealing in pain but that is—let’s have a look—inch perfect. “Now, back onto the Isn’t. She really only has one throttle position here and it is in the carpet. Okay, lifting now and into the Old Lady’s House Complex. Working the low speed grip through there. Yup—and back on the gas for the bumpy run to Substation. Showing no mercy down there. Leaving the braking nice and late, tidy line through the second-to-last corner. “Just Field of Sheep to go. Really on it through there—and across the line! Weird, right? The omission of her name was actually so glaring that it distracted me from the show. In fact, it was only during the credits did I actually learn who this pilot was. Eaton is a 25-year-old professional racer driver from England. According to her website, she’s raced in the SAXMAX Championship and the Production Touring Car Championship, where she was the Class B champion. She’s also driven in the Mazda MX-5 SuperCup and was crowned the champion there as well. After that, she drove in the GT Cup, the British GT Championship and with the Blancpain Endurance Series, where she was the first woman to finish first in her class. And when she’s not doing all of that, she works as a driving coach at Silverstone, according to The Sun. To make sure this isn’t just a thing that happens on The Grand Tour, I went back and watched the premiere season’s first episode, where Skinner is makes his appearance. Clarkson brings up both his NASCAR background and his name there. What gives? When tapped for comment, a spokesperson speaking on behalf of Amazon speculated over the phone that because the public reaction to Skinner was so overwhelmingly negative, the producers decided to downplay the role of the driver from a character to merely a driver. They couldn’t use an anonymous driver like the other car show does, so this is what we ended up with. I don’t believe this is the full reason, because you can totally introduce a new race car driver and also publicly provide her name without making her into some kind of character on the show, like Skinner or the Stig. It seems like the producers told Skinner to put on a personality they wrote for him, which backfired spectacularly and now they’re trying to fix their mistake by minimizing the role of the driver altogether. Still, it’s good to see some more diverse representation on a show as big and influential as The Grand Tour. I can’t wait to see Eaton drive in future episodes. But let’s hope the show lets everyone know who she is. What Do You Want To See On The Grand Tour Season 2?